Day 2 – our first full day of walking after a Day 1 that got started at 3 in the aft due to the time needed to get to the trailhead at Lemosho Glades. In reality, none of our days involved a lot of distance walked with the exception of summit day when we did about 15 km. 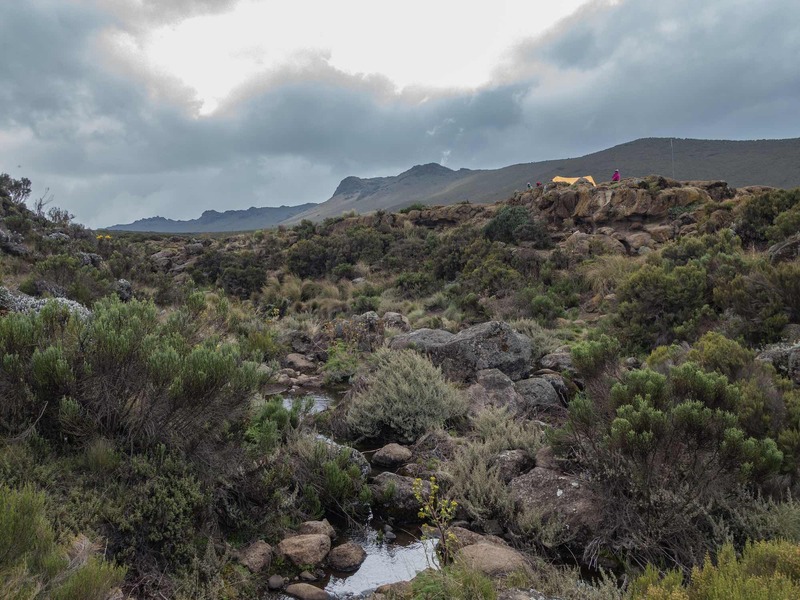 Blue skies as we set off around 8 a.m. for the Shira plateau and our next camp – Shira 1. By 10:30 we had gained enough altitude to have left the rain forest behind. The forest was giving way to heather and we were in the ecological zone called the moorland. I turned back to the west and on the horizon I saw my old friend Mount Meru, eighty kilometers from where we were standing. The week before I had stood on its summit; now we were heading to Kibo and Uhuru Peak, Africa’s highest point. 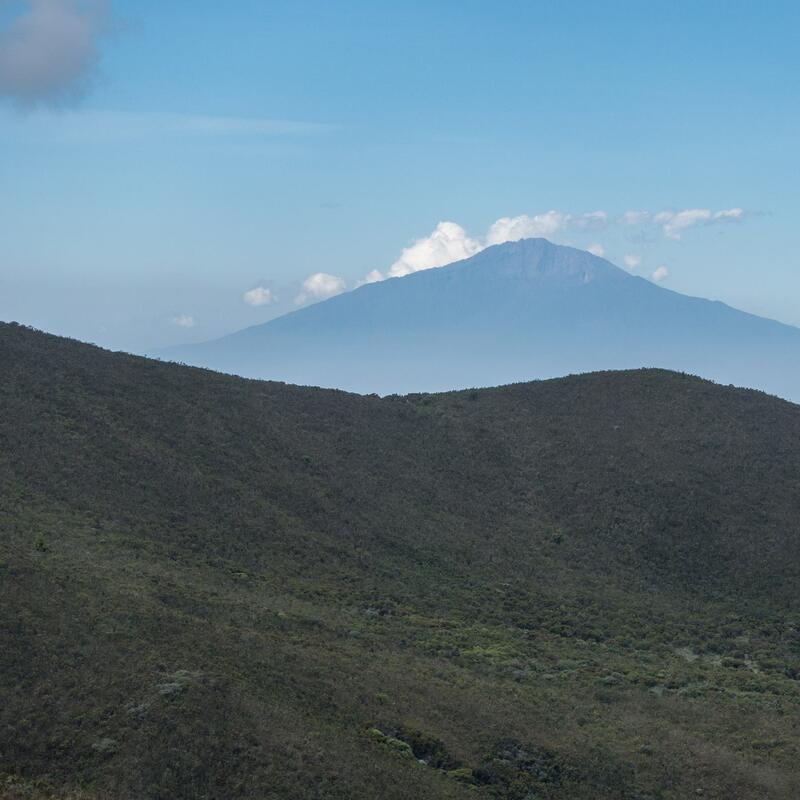 Mount Meru – Tanzania’s second highest mountain at 4566 meters. 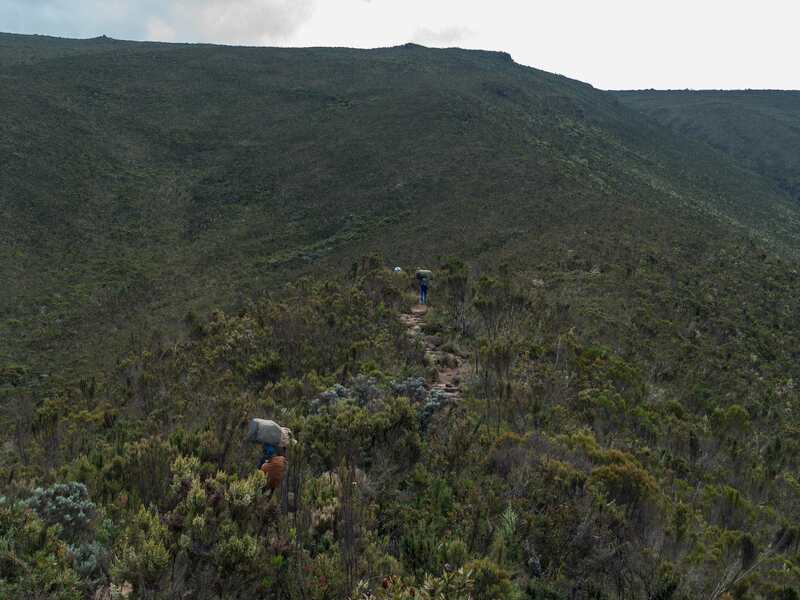 Knowing that the day’s route had 700 meters of altitude gain, we were not surprised by the sustained walk up to the top of the ridge pictured below. While we moved slowly along the trail – pole pole! – our porters travelled at a higher speed, even with the 30 kilograms on their backs or on top of their heads. Often they would be the visible clue about where the trail was and where it was going! By noon we were up on the Shira plateau. 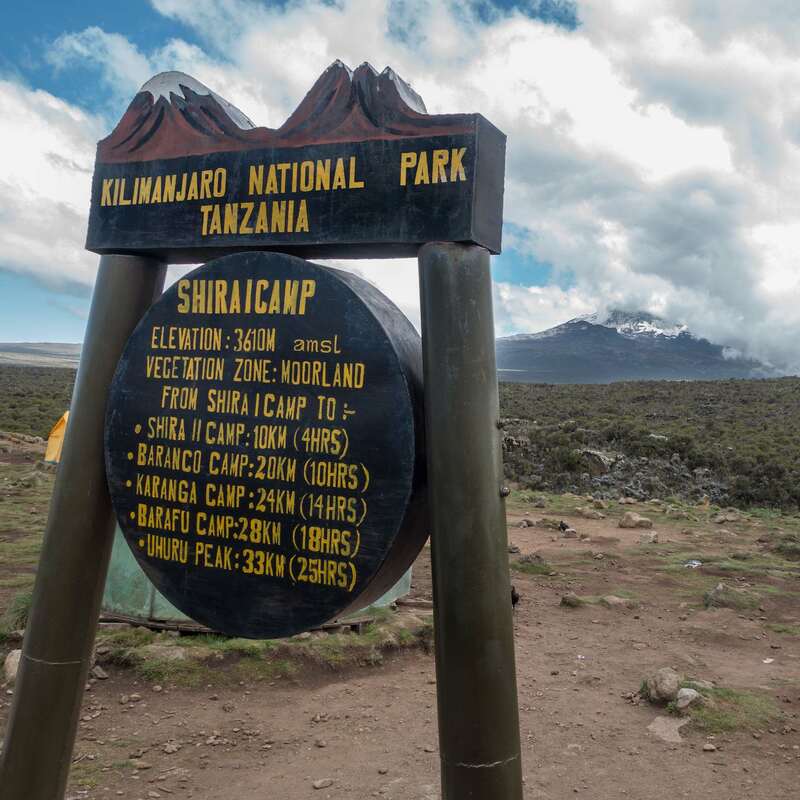 One of the guides had told us that the Kilimanjaro massif is made up of the remnants of three different volcanoes, Shira, Mawenzi, and Kibo. While the first two are extinct, Kibo is categorized as dormant. 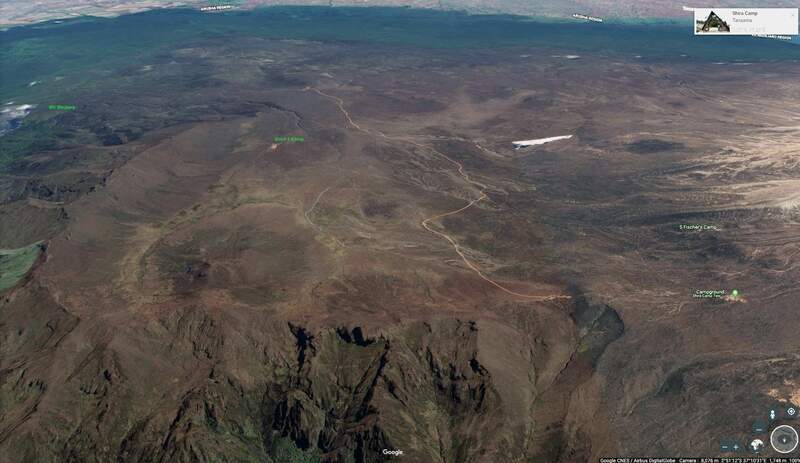 The Shira plateau is actually the crater of the volcano that Shira once was. 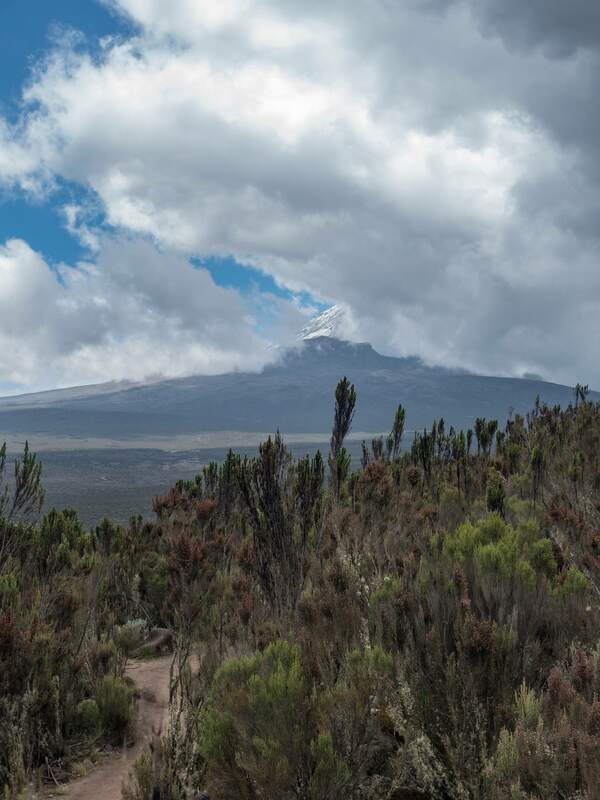 Of the three volcanoes, Kibo is the highest on Kilimanjaro. The goal of our trek was to climb up to that rim at Stella Point and walk along the rim to Uhuru Peak. As we came to the top of the ridge and looked over the Shira plateau, we got our first view of Kibo. Well, more of a tease than a clear look. Cloud cover prevented a full view; we’d have to wait until the next morning before the day’s clouds rolled in for Kilimanjaro summit to be completely visible. But still – there it was, the first view of the objective of our “expedition”! Everyone pulled out their cameras or smartphones and took the requisite photo to capture the moment and the view. Our Shira 1 campsite is in the middle background of the image above; we’d make a gentle descent down to the plateau and our camp. Already up when we got there was our entire camp – the cook tent, the dining tents, our sleeping tents, each with the right duffel bag sitting by the door, and our toilet tent. Nearby the camp there is a stream that provides water for the cooking crew. Note: The altitude figures in my post do not always agree with the ones on the Kilimanjaro National Park signposts! I have taken all my altitude figures from the fifth edition of Henry Stedman’s Kilimanjaro: the Trekking Guide to Africa’s Highest Mountain. 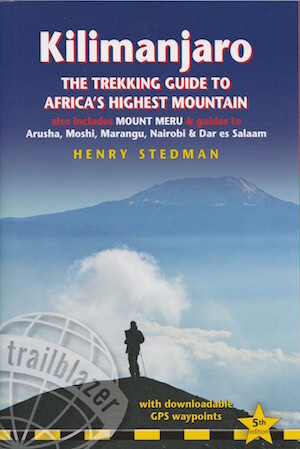 It is the single most useful and reliable source of information on the mountain and the various trekking routes to the top, as well as all the usual background material needed to organize the trip – trekking agencies, accommodation in Arusha and Moshi, and much more. Our first camp was in a forest clearing and quite sheltered. The Shira 1 camp sits on volcanic rubble with very little vegetation around. In the image below you can see the green cook tent in the foreground, the dining tent in the background and our tents. While four of us had tents to ourselves, the one couple on the trip got to share. Their conclusion: two people and two duffel bags in one tent make for a very crowded space. Standing in the middle of the sleeping tents is our beige toilet tent. 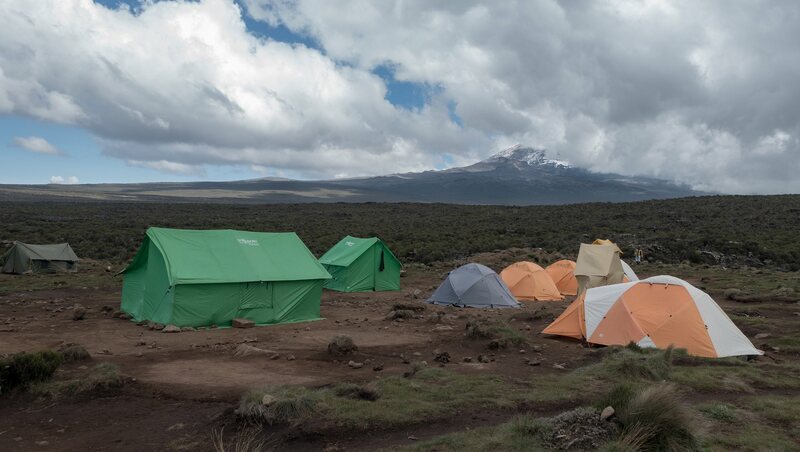 I’ve already mentioned that Popote Africa Adventure, the Moshi agency that organized and ran our trek, provided us with a toilet tent at no extra cost. [it is usually $125.-$150.extra.] Yet another way agencies will sometimes increase the cost of the trek is by charging extra if you want to have your own tent or hotel room at the start and end of the trek. Ultimate Kilimanjaro, for example, has a supplemental charge of $259. for this. Popote did not put two solo trekkers in the same tent; instead, it provided a tent for each without charge. Shira 1 Camp at 3500 m.
some of the many original outhouses at Shira 1 camp – the foundations of a palatial facility like at Mti Mkubwa waits to be built on! In the image below the stream which provides Shira 1 Camp with water is visible; so too is a short section of the badly eroded rim of the ancient Shira volcano in whose crater we were tenting. Here is a satellite view which illustrates more clearly the remnants of the caldera rim on the edge of the Shira Plateau where we were camping. For a “live” Google Earth view that you can play with click here! [Note: the Google Earth app has mislabeled the Shira 1 Camp as the Moir Camp. The Moir Hut is actually higher up at 4610 m and is located to the NE of Shira 2 Camp. See here for a trip report which makes clear the difference. Day Two was done and everyone was feeling fine. 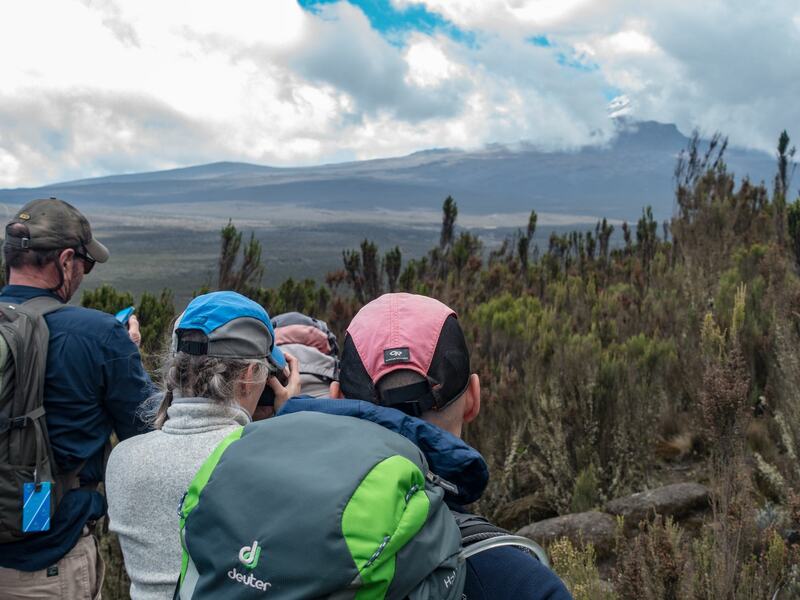 We were walking slowly, taking lots of water breaks, eating well – in short, doing all the things you should be doing to make a success of a walk to the top of Kilimanjaro. All of us were also taking our Diamox tablets – splitting it in two and taking 125 mg. in the morning and the other 125 in the evening. A solid night’s sleep is the other ingredient – off we went to our tents at 8:15. It was definitely cooler than it had been at the Mti Mkubwa Camp. I put on my base layer of expedition fleece (both top and bottom), as well as my wool hat, and zipped my sleeping bag (rated to -10ºC) shut.